Loose Ends is now available at Amazon, Barnes and Noble, and other major independents. Buy it now!!! Loose Ends, the second novel in the Fenway Burke Mystery series has been released! Buy now at Amazon, Barnes and Noble, and other major bookstores! Loose Ends, the second novel in the Fenway Burke Mystery series has been released! Buy now at Amazon, Barnes and Noble, and other major bookstores! Watch the announcement video on YouTube! Download the first three chapters of Frame Up, James Phoenix's first novel, onto your tablet, Kindle, Nook, Kobo, or e-reader of your choice for free. 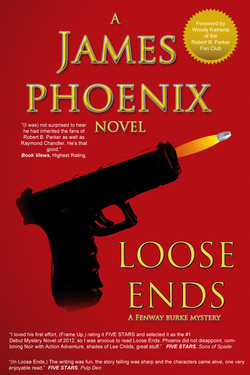 The critics are calling James Phoenix the next Robert B. Parker and that’s exactly who he is. September of 2012, Frame Up, the first novel in the Fenway Burke Series opened to nothing but rave FIVE STAR reviews...And with Loose Ends he’s at it again, only even more so. James Phoenix brings a fresh new approach to a very old genre. His Hero Fenway Burke is not only a true feminist he is the very first happily married man in the history of the Hard Boiled Detective genre. In fact he has a beautiful baby girl he dotes over. He’s an actual human being, the guy next door...But fear not Parker, Chandler and Dashiell Hammett fans...Fenway Burke can punch a hole though a brick wall with either hand and never hesitates to do just that when the occasion arises. He’s a very nice guy, a guy you’d be happy to see show up with his family for your cook out, but he’s also a true hard guy, who looks out for the weak and has a real sense of what’s right and what’s wrong. Pick up Loose Ends. You’ll have a very hard time putting it down!